A good observational documentary is sometimes hard to find. Interesting subjects might fall victim to formless fly-on-the-wall efforts, which can be effective if the fly observes them just right, but a better observational doc usually finds a voice and rhythm to match the urgency of its subject. Dieudo Hamadi’s National Diploma is a good example of a swell doc that does the latter. This rare and personal film gets close with its subject all the while maintaining enough of a distance to interrogate the system of which they are a part. 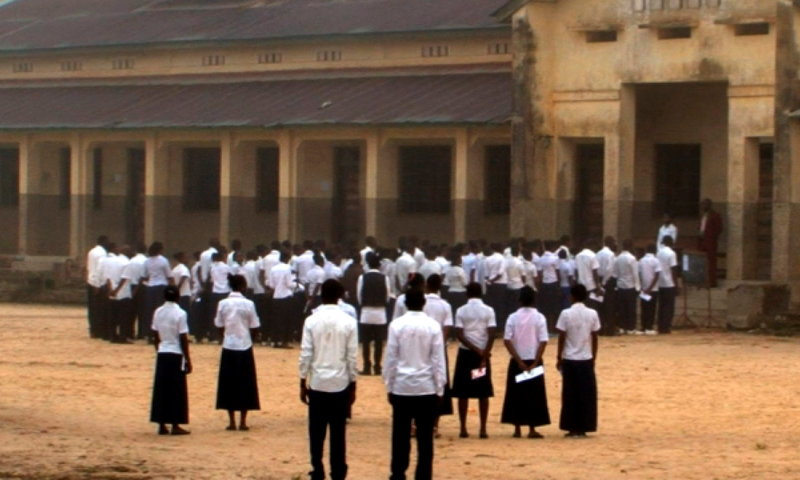 National Diploma observes a group of students in Hamadi’s hometown of Kisangani in the Democratic Republic of Congo after their school ejects them from their studies to achieve the elusive national diploma (like a statewide BA) because they fail to pay the required fees. The diploma opens opportunities that are hard to find in the impoverished country (a characteristic Hamadi captures matter of frankly simply by portraying life as it is) that is equally wrought and squeezed by corruption (which Hamadi captures just as well in the same objective fashion). Hamadi follows the students as they leave the school, pool their money to rent a neglected house, and start their own studying collective. The students display far more enthusiasm for learning than their instructors do for teaching, for the teachers at the school are essentially tax collectors. The do-it-yourself philosophy and genuine thirst for knowledge seems like an appetite that many Western students take for granted. National Diploma shows the benefits of education as something other than a public right and service. Students have to pay to play if they want to better their prospects, so National Diploma chronicles the massive pressure these students face as they struggle through a system that is bent into an almost unnavigable maze thanks to economic circumstances and faults in the system. Take away the right to an education, though, and the value of structure and knowledge becomes urgently apparent in its ability to determine one’s life path. “It’s impossible to get the diploma without cheating,” one student says when the group bands together to pay for the services of one of several black ops tutors who sells leaked answer at a costly price. National Diploma therefore also shows the fallacy of 'progress' at the expense of education. The students aren’t really learning much in their efforts to pass—aside from how to cheat—so the film inevitably asks what kind of future the students may have if they have a piece of paper without the knowledge to support it. Some display the potential to be tomorrow’s leaders as they take the initiative to succeed through merit and effort, but National Diploma ultimately pits survival as a game in which one must navigate and manipulate a system designed for the success of few. Getting a diploma shouldn’t be like playing The Hunger Games, and National Diploma unfolds the quest with a similar thrill of suspense. The pressure to succeed mounts as Hamadi offers footage that portrays the exam as a kind of collective ceremony. It’s a day for pride as the events leading up to the written exam include a spiritual ceremony in which students name their pens and give them away for safekeeping because their instructor teaches them that a pen is the extension of the mind. (Stealing a mate’s pen is thus like nabbing some crib notes.) Similarly, the masses circle around the written exams on delivery day and watch as the authorities cut open the metal box as if it were a cake. On the other hand, Hamadi laments for the unavoidable element of exclusion that comes with national standardization. The finale of the film sees the students receive their grades, and Kisangani booms like downtown Ottawa on Canada Day as the students hoot and holler with joy at passing the test. Rather than focus on the elation, though, Hamadi zeroes in on the one student who fails to pass the exam. Hamadi trails him through the cacophony as the jubilant noises of the background envelop him like clouds, and the reality sets in that this one boy among many will not face the same opportunities for which his friends now hold an advantage. Hamadi, by simply zooming in on one student amidst the crowd of graduates, powerfully conveys a future shattered as they boy solemnly walks home as his peers celebrate their victories with youthful triumph. Dreams and despair share the frame in National Diploma, for Hamadi takes both an insider and outsider’s look at the exam to share the students' glory as well as their pain. National Diploma is currently seeking distribution. Reviewed at the 2014 Toronto International Film Festival.